Lifting up heavy objects off the ground can wreak havoc on your back over time. That’s why you need to invest in a material lift. Not only will they save you time and energy on the job, but they will also save you money because they can help you lift items that normally require multiple people. Some material lifts have maximum lifting capacities of up to 650 pounds, and some can lift as high as 24 feet! 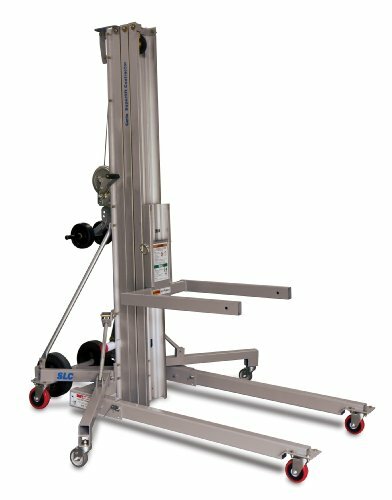 If you are a contractor, or someone who regularly lifts heavy objects, you really should purchase a material lift. We put together the most comprehensive review of the best material lifts on the market. Lots of time and consideration was put into this list. We hope that you find this information useful when you are purchasing a material lift. Wesco Industrial Products 273511 Aluminum/Steel Hand Winch Lifter with Fixed Base, 500-lb. 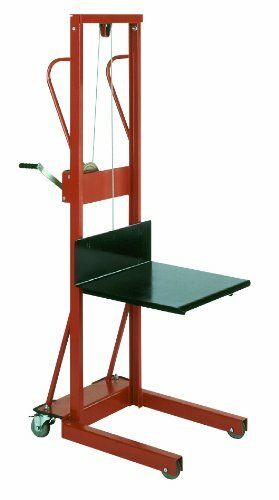 Capacity, 24" x 35" x 68"
A high weight capacity is one of the standout features of this lift. Capable of lifting up to 880 pounds, it is one of the strongest lifts in this review. The lift is powered by a manual hydraulic foot pump. The platform of is removable, allowing use of the forks underneath. The total weight of this lift is 275 pounds. The lift is 69 inches tall, and is capable of lifting items up to a maximum height of 59 inches. The minimum height of the lift is 3 inches. The overall length of the Vestil is 41 inches, while the width is 23 inches. The conclusion of the testers of this product is that it is sturdy and well-built. Another user claims that it works well for lifting oil drums. Another strong lift capable of lifting up to 880 pounds is the Wesco Value Lift. 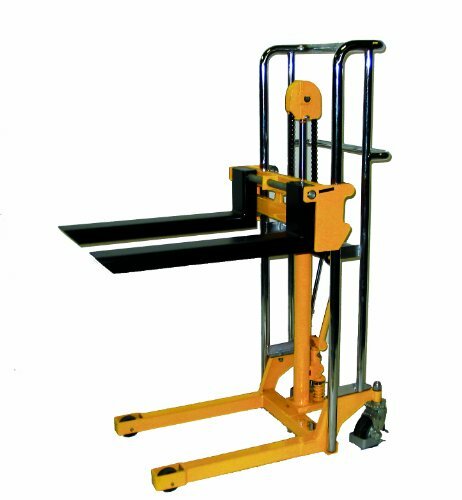 While this lift cannot lift items as high as the previously mentioned Vestil, it is more affordable. The Wesco has a maximum lifting height of 47 inches. The minimum lifting height is 3.5 inches. This lift is powered by a manual hydraulic foot-operated pump. 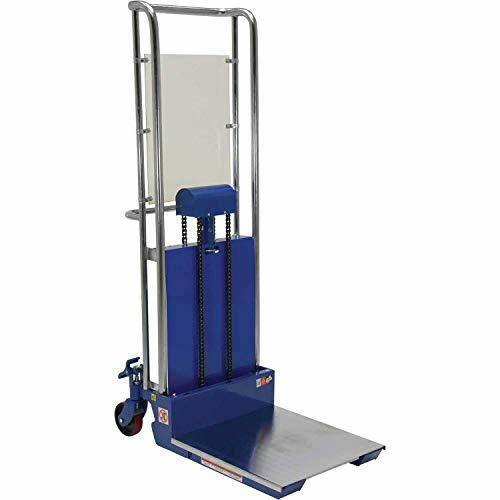 Balanced on four wheels, this material lift makes it easy to lift and transport materials. The lift measures 55 inches tall, while being 36 inches long, and 22.5 inches wide. The total weight of the Wesco is 163.02 pounds. Buyers of this lift have commented that it is a good piece of equipment, although, it can be difficult to assemble. 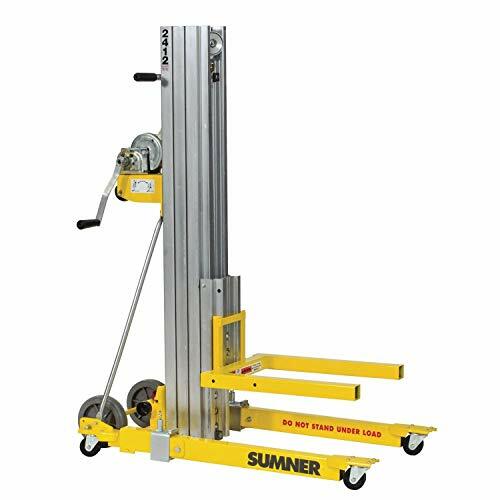 If you are looking for an inexpensive lift that is capable of carrying heavy loads, this just might be the right product for you. Wesco 272940 Value Lift with Handle, Polyurethane Wheels, 880-lb. Load Capacity, 47" Lift Height, 22-1/2" x 36"x 55"
The Wesco 272941 is almost identical to its brother model, the 272940, with the main difference being in lifting height. While the 940 model can only lift to 47 inches, the 941 has a maximum lifting height of 59 inches, providing an extra foot of lift height. The extra height comes at a price, as the 941 is slightly more expensive. Another feature of this lift is the two fixed 3 inch wheels, with another two 5 inch wheels that swivel. This lift also comes standard with a hydraulic foot pump, for easy raising and lowering. The lift measures 70 inches tall, while being 37 inches long, and 22.5 inches wide. Testers of the lift stated that it was well worth the money. One person even used it to transport a piano! The Wesco 941 is an exceptional lift that provides a little more lift height than other models, while being slightly more expensive. Wesco 272941 Value Lift with Handle, Polyurethane Wheels, 880-lb. 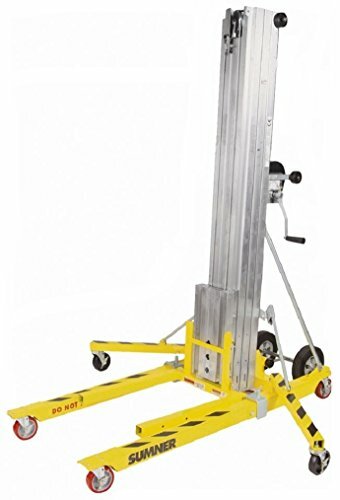 Load Capacity, 59" Lift Height, 22-1/2" x 37" x 70"
If you are searching for a small lift that is winch-operated instead of hydraulic-operated, this might just be the lift for you. 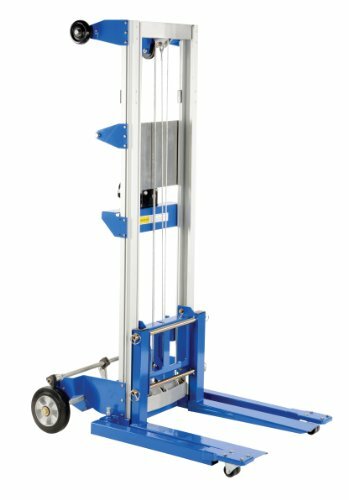 With a slightly lower maximum load capacity of 500 pounds, this lift will take care of all but the heaviest of your lifting needs. This lift comes standard with an auto-brake winch, and wheel locks to ensure safety. The lifting platform is 20 inches by 20 inches, providing ample area for raising items up. The Wesco is has a 54 inch maximum lifting height, and a 5.75 inch minimum height. The overall height of the lift is 70.5 inches, while the width is 20 inches, and the length is 30 inches. A customer that bought this lift commented that it is a simple lift, but is great for the price. Genie is the premium brand in the material lifting space, making more effective and reliable lifts than any other manufacturer. Unfortunately, this quality also comes with a price, as the Genie lifts are more expensive than other brands. The Genie Load Lifter, LL, is no exception to this rule. It is very pricey for only being rated for 200 pounds, and having a maximum lift height of 65 inches. This quality lift is made out of lightweight and durable aluminum, resulting in an lift that is easy to use and move. The lifting platform is beveled for better grip on items. The rear wheels are eight inches, while the front wheels are 2 inch swivel casters. Another nice feature on this lifter is the stair glides, that make it simpler to use while going up and down stairs. The Genie is powered by a winch. In total, it weighs 58 pounds, far lighter than most lifts in this review. 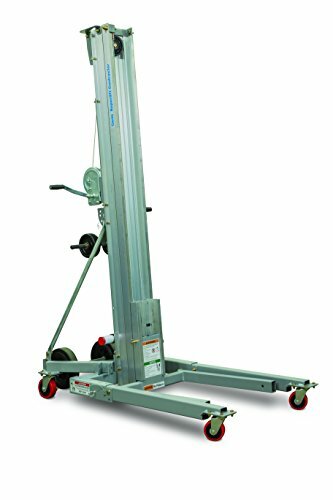 Genie Load Lifter, LL, Portable, Aluminum Manual Lift, 200lbs Load Capacity, Lift Height 5' 7"
If the Genie lifts are the Mercedes of lifts, then the Vestils are the Hondas – affordable, but extremely reliable. 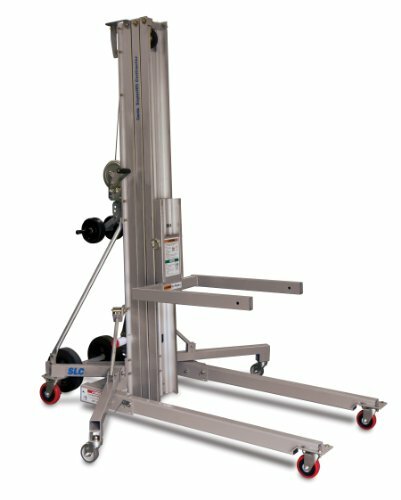 The Vestil A-Lift-S-HP is nearly half the price of the comparable Genie model, yet is able to lift twice the capacity, 400 pounds. Although the vestil is not loaded with as many features, it still has a few nice ones. For one, it has a weight on it that is designed to counterbalance the lift, and keep it from falling over while transporting loads. Another nice feature is the device that secures loads to the lift while moving. The Vestil is powered by a hand winch. This lift has a maximum lifting height of 68 inches. The total weight of this lift is 145 pounds. The Vestil is a great choice for a person looking for an inexpensive but effective lift. The Wesco 273511 lift is a solid choice for a lift in the 5 to 9-foot range. With a maximum lifting capacity of 500 pounds, this is one of the strongest lifts in this category. The 273511 has a maximum lift height of 5 feet 8 inches, or 68 inches. Made of aluminum and steel construction, this lift is lightweight and durable. It has a shipping weight of 143 pounds, and is powered by a manual winch, that has a safety locking feature. The lift is 68 inches tall, 35 inches long, and 24 inches wide. Product testers said that this lift was capable of meeting all of their needs. Although, one person had received a lift with a bent winch from shipping. The Genie Superlift Contractor was designed for industrial and construction use. There is no doubt that this lift will meet those needs. 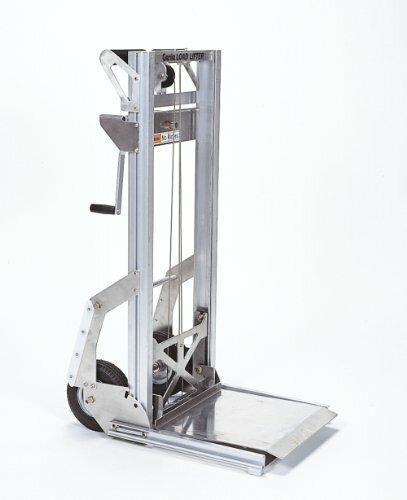 Designed with steel forks for lifting even the heaviest of loads, this lift is very capable. The Superlift has a maximum lift height of 12 feet ten inches, or 154 inches. The maximum lift capacity is 650 pounds. It is powered by a single-speed manual winch, and is designed to be used by one person. One of the great features of the Superlift is the “hold-down bar” which is used to stabilize the mast while moving it around. Another nice thing about this lift is that it is designed to fit through most doorways. The lift weighs 225 pounds altogether. The product testers said that they loved this lift. Sumner manufacturing has received high marks for its customer service and product reliability. This lift made by them is no exception. The Sumner 784750 model is a great budget choice for contractors who are a little strapped for cash. Less expensive than some of the other models in this category, it can save you some money. This lift has a maximum lift height of 12 feet on the nose, or 144 inches. The max lift capacity is 400 pounds. An auto-braking winch, reversible and removable forks, and 3 inch castors are some of the great features found on this lift. Testers of this product remarked that it was a “great piece of equipment”. This lift will start us off with the largest category in our review of lifts. The Sumner 783652 is the most affordable model in this category. Although, that does not mean that it is the worst. Let’s start off with some of the basics. This lift has a maximum lift height of 288 inches, tied for the tallest lift in this review. Having a max lift height of 24 feet should be plenty to handle all of your lifting needs. The weight capacity of this lift is 650 pounds. Some of the features of this lift are a sleek design – making it capable of fitting through standard doorways, and its lightweight construction, weighing in at just 399 pounds. Receiving overwhelmingly good reviews, this is one of the best lifts in its height range. The Genie Superlift Contractor SLC-18 is a great choice if you do not need to lift over 20 feet. The maximum height for lifting on this model is 18 feet 6 inches, or 222 inches. Weighing in at just 307 pounds, this is the lightest lift in its height range. As with all Genie lifts, the SLC-18 is packed with awesome features. It is powered by a manual winch that is single-speed, and also has a retractable aluminum construction mast. Another nice feature of this lift is its non-marking wheels. If you need a lift that is loaded with features, but don’t need to lift over 20 feet, this may just be the lift for you. 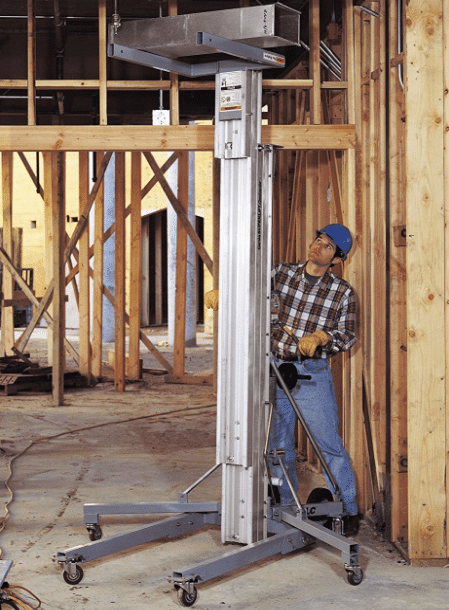 The Genie Superlift Contractor SLC 24 is the last lift in our review. It has a maximum lifting height of 24 feet, and maximum lifting capacity of 650 pounds. The lift forks are made out of steel, providing strength and durability for all your lifting needs. 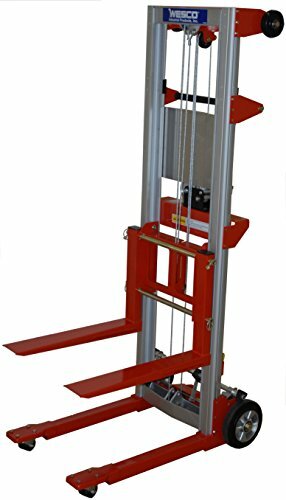 The nice thing about this lift is even though it was designed for use in industrial and construction workplaces, it is made to be used by a single person. It is powered by a manual winch, with a single speed. The SLC-24 has all of the features that other Genie lifts have, like the non-marking wheels. If you are looking for the most capable material lift, and are willing to spend the money, this may be the one for you. Hopefully you took the time to read through the reviews of each material lift, as we carefully crafted this list to include the best products on the market. We truly believe that investing in a material lift is the smart move, as it will pay for itself over time.